Improving understanding of the role of dominant, habitat-forming species in shaping patterns in biodiversity and ecosystem functioning at local and landscape scales is a primary focus of our research group. We specifically focus on elucidating the factors that drive variation in foundation species' distributions and quantifying how these underlying patterns mediate community assembly and key ecosystem processes, such as decomposition and nitrogen cycling, and on identifying what mediate the resilience of these species. As protecting or restoring these species is often a central aim of ecosystem management, we also work to translate knowledge gained from our work to restoration practitioners and natural resource managers. Below are several concepts that we are testing and refining. The Foundation Species- Biodiversity model (a) and visual diagram of the three types of facilitation cascades (b) it predicts. Where secondary foundation species increase habitat availability within a primary foundation species, we predict they enhance abundance (Type A); where secondary foundation species exhibit functional traits different from those of the primary foundation species, we predict they enhance diversity (Type B), and where they both increase habitat availability and exhibit different functional traits, they enhance abundance and diversity (Type C). Abundance and diversity increases are relative to communities associated with a primary foundation species alone. Primary foundation species (tree) may directly facilitate communities, as shown in the left panel, or interact with secondary foundation species (fern) to indirectly facilitate communities in a Type A, B, or C facilitation cascade (middle and right panels). The number of fern icons represents the relative increase in habitat availability generated by the secondary foundation species (many ferns= large increase, one fern= little increase), and the color of fern icons denote whether they exhibit similar (black like the tree) or different (green) functional traits than the primary. Invertebrate icons refer to feeding guilds; node size represents abundance; and lines connecting nodes indicate species interactions. Types of foundation species assemblages. Foundation species may form (a) nested or (b) adjacent assemblages. In nested assemblages (a), positive interactions hierarchically structure communities in facilitation cascades where the first foundation species to colonize a habitat facilitates other foundation species and through complementary structural complexity they support diverse species assemblages. 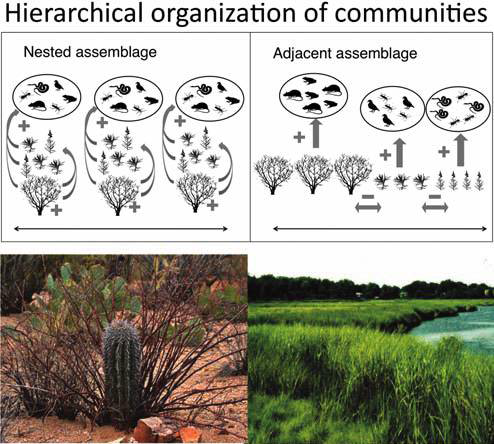 In adjacent assemblages (b), foundation species compete for space to form discrete competitively determined zones, where structural complexity is mediated locally by the dominant foundation species and drives variation in community composition across zones. In both nested and adjacent assemblages, multiple foundations species are needed to support diverse communities and maintain higher order interactions at landscape scales. Nested assemblages are apparent in the Sonoran Desert where shading and nutrient deposition by nurse shrubs facilitate the growth of saguaro (c), and the adjacent assemblages of salt marsh grasses are a striking feature along wave-protected New England shorelines (d). Context dependence of interactions among foundation species. Despite a common pool of species, shoreline community composition (a) varies widely across hydrodynamic stress gradients in New England as a consequence of foundation species interactions shifting from competitive along wave-protected coasts, to facilitative along wave-battered cobble beaches. 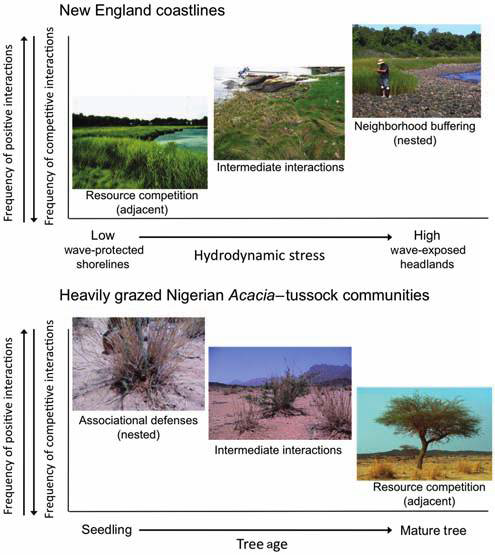 Likewise, the nurse tussock, Panicum provides a critical refuge for Acacia seedlings from grazers in intensively browsed, arid Nigerian landscapes, but competes with Acacia for water as trees mature and become less vulnerable to predation (b). Photo credits: Andrew Altieri and Fabien Anthelme. Crotty S.M., Sharp S.J., Bersoza A.C., Prince K., Cronk K., Johnson E., Angelini C. 2018. Foundation species patch configurations mediates biodiversity, stability and multifunctionality. Ecology Letters. https://doi.org/10.1111/ele.13146. Borst A., Verbreek W.C.E.P., Angelini C., Schotanus J., Wolters J., Christianen M., Derksen-Hooijberg M., van der Heide T. 2018. Foundation species enhance food web complexity through non-trophic facilitation. PLOS ONE. https://doi.org/10.1371/journal.pone.0199152. ​Angelini C, Briggs KL. Spillover of secondary foundation species regulates community structure and accelerates decomposition in oak savannas. Ecosystems 18: 780-791. Angelini, C., Silliman, B. R. 2014. 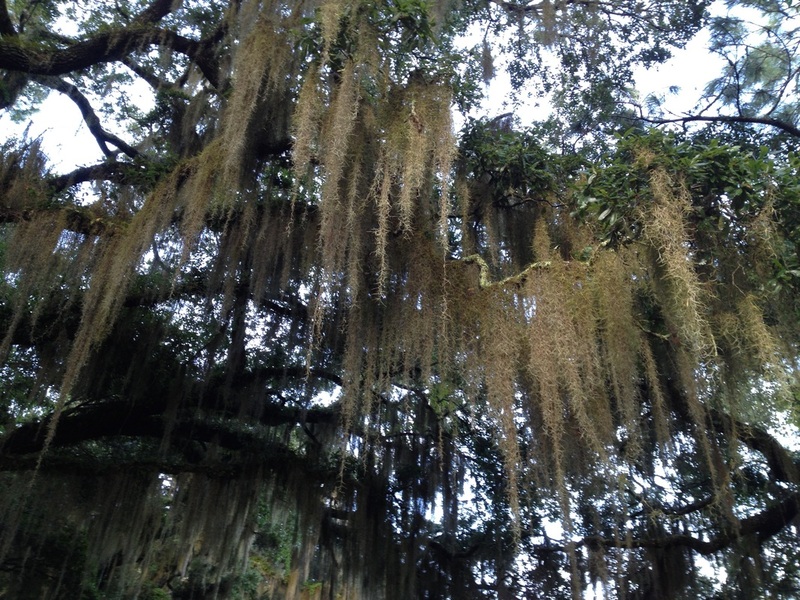 Secondary foundation species as drivers of biodiversity and trophic structure: evidence from a tree-epiphyte system. Ecology 95(1): 185-196.